In May of this year (following a number of road traffic accidents on Parr Lane, outside the Co-op store), I asked Greater Manchester Police to conduct a road survey to see if we could determine how serious the speeding traffic had become. 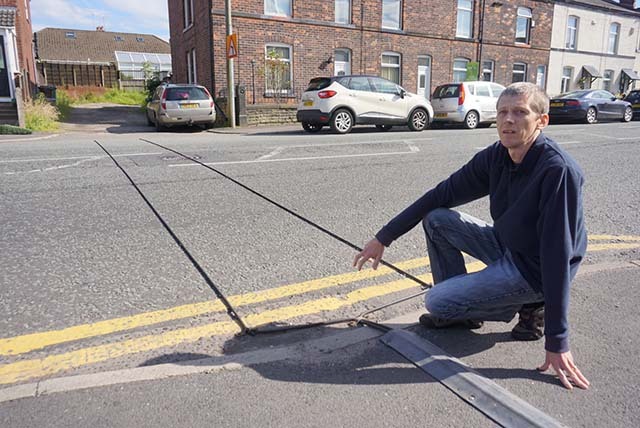 During June and July local residents may have noticed the survey box and cables appeared at the junction of Parr Lane and Chadderton Drive (see picture) and this has subsequently been removed, once the survey came to an end. Greater Manchester Police’s Territorial Support Section – Specialist Operation Branch have now written back to me with the results and I am very grateful to PCSO Angela Jarvis for taking the time to do this. The survey results showed an 85th percentile of 31.3 mph and a Mean speed of 26.4 mph. These results are very low with the 85th percentile only just above the posted speed limit but below the enforcement speed and the Mean speed is below both. GMP have to prioritise all speed enforcement work so that we are where we are needed the most, due to the results of the survey Parr Lane would not fall into our priority for enforcement at this time. Unfortunately, the results mean that GMP will not be enforcing the current 30mph speed limit on Parr Lane, in or around the area of the Co-op. This is disappointing since the results clearly show that 15% of all traffic is travelling at a speed greater than 31.3mph. Further, I was disappointed with the siting of the survey equipment. By positioning the equipment so close to the junction with Chadderton Drive, inevitably the survey is skewed by those cars that have slowed down to make the turn into, or those pulling out of Chadderton Drive (which by the very nature of the turn, means it can only be achieved at speeds lower than 30mph). Ultimately, I feel this is an issue not worth pursuing further at this point in time. Should the 20mph streetsafe zone scheme be resurrected, it may well be worth making further submissions to the council. I am very disappointed that none of Unsworth’s three Labour councillors have become involved in this issue, nor even expressed concern at our local traffic problems.